We'd follow a cheesecake tunnel anywhere! 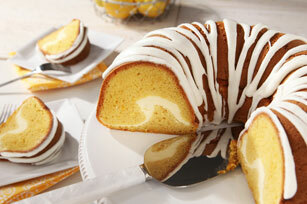 This one especially—because it leads through a super-moist lemon cake topped with lemony drizzle. Grease and flour 12-cup fluted tube pan or 10-inch tube pan. Beat 1 pkg. cream cheese and granulated sugar in medium bowl with mixer until blended. Add egg; mix on low speed just until blended. Prepare cake batter as directed on package. Blend in dry pudding mix and lemon zest; pour half into prepared pan. Spoon cream cheese mixture into ring around centre of cake batter in pan; cover with remaining cake batter. Bake 45 to 50 min. or until toothpick inserted near centre of cake comes out clean. Cool cake in pan 10 min. Loosen cake from sides of pan with knife. Invert cake onto wire rack; gently remove pan. Cool cake completely. Beat icing sugar, lemon juice and remaining cream cheese with mixer until blended; drizzle over cake. Let stand until firm.